So Twitter was ablaze, and I read countless, heartbreaking Alive While Black tweets and I started to think. I have numerous stories I could share as well. I am not a Twitter aficionado (see my 1,400 tweets in 3 years), but sometimes I do have something important to say. 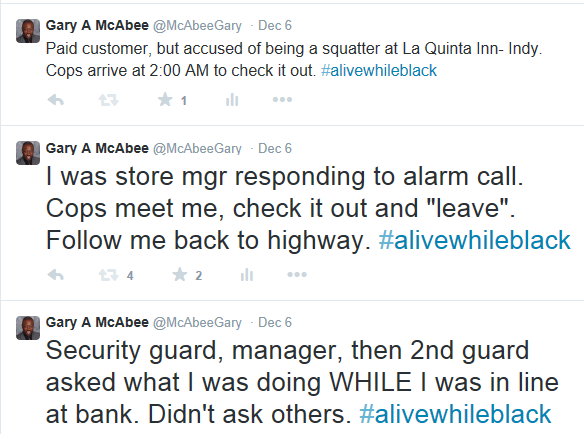 So I took to Twitter and shared some of my Alive While Black stories. It was a brief moment of cleansing that I “enjoyed”. I have to be honest though: 140 characters do not adequately explain the memory of these episodes that I carry around every day. I was pleased to have several people re-tweet and even share my anecdotes, as if doing so was their validation of each situation and an indication of having similar shared experiences. 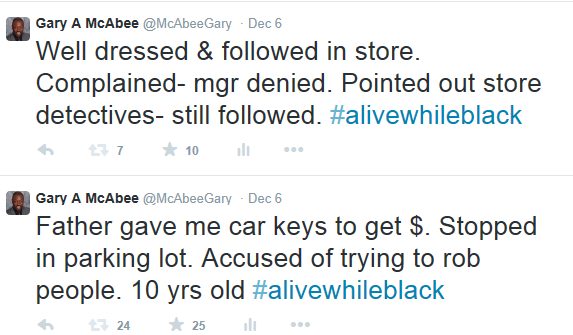 I have included several of my Alive While Black tweets here. Take a look and let me know what you think! I will let my loyal readers be the judge. However, I want to be clear that these are all real stories and memories I will never forget. By the way, this is not even the tip of the iceberg. 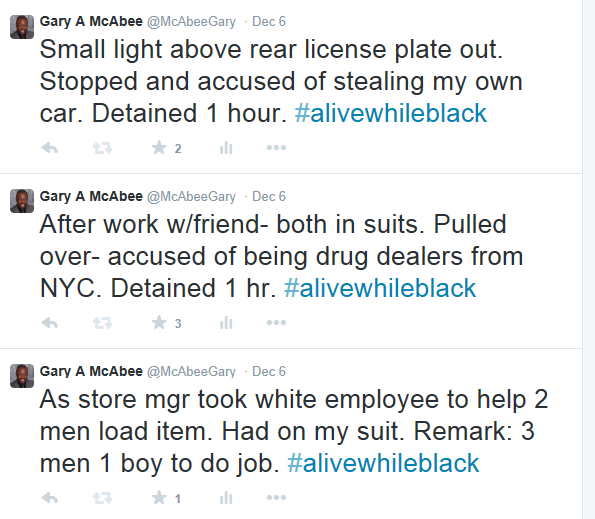 For you see, I have numerous other Alive While Black stories. Maybe I will turn them into the next book I write. In the meantime, I hope you can at least appreciate that people of different colors do have different experiences. Saying these issues don’t exist is a way to minimize, if not totally ignore their existence. In my opinion, in order to bring people together, we need to start by accepting that we are treated differently sometimes. Then we can move forward to find solutions. 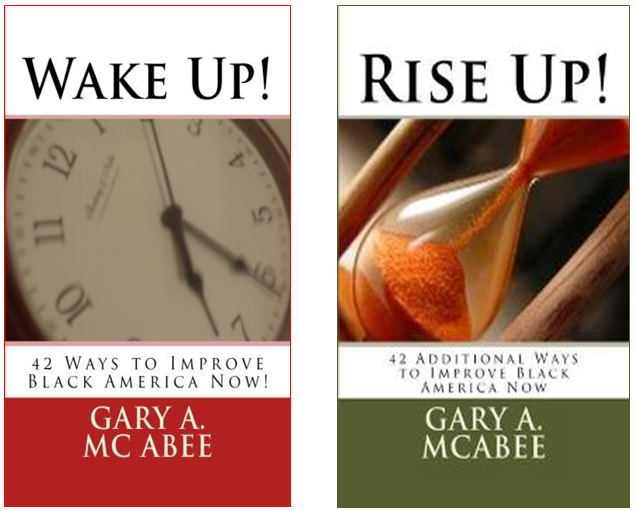 By the way, my Twitter handle is @McabeeGary. I need all the friends/followers I can get. This entry was posted in Uncategorized and tagged African-American, Alive While Black, Black Lives Matter, Racial Profiling, Twitter on May 8, 2015 by motivationfortheworld.